This is an issue that I have run across before.¬† People have asked for¬† a curtain panel with parametric louvers.¬† Well, the closest I can get is a semi parametric louver panel and there are a couple of ways to accomplish this.¬† FYI, this is more of a lesson than a tip… kinda halfway between.¬† There are a lot of steps missing here that the tip assumes you know in order to accomplish these things. Way number 1: Semi parametric nested array. This method incorporates a nested array into a curtain panel family.¬† This requires you to manually control the height and width of the panels in order to get the arrays correct.¬† Recommend doing types so you can “Select all instances” if needed.¬† A quick rundown of this method (and the usual video! ).¬† This does require you to have previous knowledge of nesting. Load panel into project and create a curtain wall from it. Way number 2: Curtain Wall for panel replacement. This method basically creates a curtain wall family made of mullions that have a louver profile and no curtain panels.¬† You then nest this louver wall into another curtain wall as the panels.¬† This is a simpler method but not as flexible when it comes to vertical louver spacing.¬† A quick rundown of this method (and ensuing video!). Replace curtain panel in second curtain wall type with louver wall type. Hope this has helped someone out there and as usual, please comment and enjoy! Revit TotD – 3.30.09: French Curve snaps! Welcome back to Revit TotD!¬† Hope everyone had a great weekend, and is looking forward to yet another Revit Tip of the Day! As usual, today’s tip is courtesy of that AHA! moment where I think that I’m taking something for granted that may not be known by some.¬† That is what a tip of the day is to me, helping increase your knowledge!¬† So I’m sitting here trying to achieve as close to an organic form that Revit allows, and I find the easiest way to form a continuous tangent curve is by utilizing the Tangent snap. You can use this to create a a continuous curve.¬† The tangents will snap to any adjoining line, as demonstrated in this video. With some patience you can actually use revit to create some rather flowing curves! Thanks for stopping by, and as usual I hope you come away with something new!¬† Enjoy! Revit TotD – 3.26.09: “Inconsistent Units”!!!!! Be honest, how many of you have received this error when working on parameter formulas?¬† Yeah… wait.¬† I only see my hand up.¬† Be honest, it’s ok.¬† I’d be willing to bet that anyone that has dealt in complex parameter formulas have received this error at one point in time. Well, here’s the solution.¬† Remember back in physics when they taught you about unit conversion?¬† Remember how you had to cancel out units by using (ft/ft = 1) or something similar to that?¬† Well that’s exactly how this work.¬† All you have to do is either multiply or divide by 1.¬† Sometimes it’s not as simple as that if the conversion is a bit more difficult.¬† The point is that if you work out the unit conversion before you do the formula you’re good to go.¬† Simple as that.¬† Here’s a video of how it works. Example of how some corrected formulas would look. It is important to notice that Revit auto fills the units in most formulas that you correct this way.¬† Angle parameters are one formula type that it will not auto-correct if the formula is too complicated.¬† This means it will be necessary to add the unit symbol or abbreviation when Revit does not auto correct this. Keep playing, it’ll work… I promise! Revit TotD – 3.25.09: What did I have selected? Today’s TotD is the epitome of TotD.¬† Short, sweet and everything a tip should be: not a full lesson! Ever accidentally lost your selection because your coworker destracted you or your boss’ cat sat on your keyboard while you were trying to select all those little detail lines?¬† Well, there is an easy way to reselect everything you just had selected.¬† If you find yourself in this situation, simply hit Ctrl+<left arrow> to reselect your last group of selected items, as shown here. Hope everyone had a good weekend!¬† I’m back with a quick tip on helping you manage those family files. 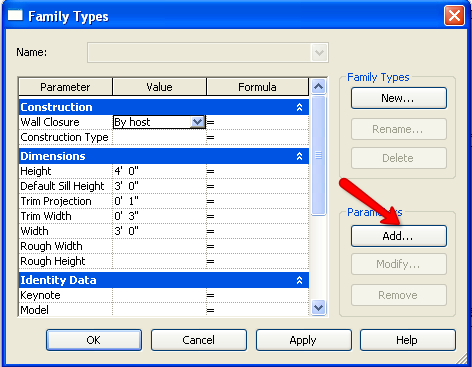 Ever notice how some of the families that come out of the box with revit have multiple options to select from before you load the family in?¬† For instance the Structural Column families give you a “Catalog” to choose from before you.¬† There is way to do that with your own families and there are only a few things you need to do to accomplish this. Video of cataloged family loading into revit. The text file must be formatted correctly. The text file must be named EXACTLY the same as the family. The text file must be placed in the same folder as the family. I’m not clear about the units portion of the formating on what happens if the parameter type doesn’t require a unit (like angles or text) as to what to do.¬† I’m guessing that you will just end the parameter group after the <parameter type> entry and then move on to the next parameter group. Some things to note about the catalogues, you have to use File > Load from Library to get the catalogue option.¬† If you drag the file into the project from a file explorer, it’s not goign to ask you which types you want to load.¬† You can select multiple types to load at once using the Ctrl select technique (shown in the video above). Hope this helped, and see you later! So today’s is going to be a simple one.¬† Weekend is coming up and I have a lot of studio work to do plus an abstract for my term paper (*gleee*).¬† So here I hope to point out some important file locations for you to play with (at your own risk).¬† Some of these are obvious to some of you, some of you just knew how to get to them inside of revit.¬† Well here’s how you can have some real fun! -Create your own keyboard shortcuts for any tool in Revit. If it has a Menu position then it can have a keyboard shortcut. -Program configurations.¬† You can add paths to plugin and 3rd party tools here if the plugin does not have an installer that does so.¬† TINKER LIGHTLY, BACKUP IF YOU MODIFY IT!!! -These are essentially a log of every activity that happens in your revit sessions.¬† They are VERY powerful and can even be used to recover lost projects if you know what you are doing. -Contains a list of Accurender -> Mental Ray mapping translations.¬† If you have a lot of Accurender materials from 2008, this may be something you want to look at. -List of Lat/Long locations for the sites available in the Project Location dialogue in the render settings. -This is the Uniformat list that ships with revit that is used by default for keynoting.¬† Use this file format to create your own office keynoting file. -Plugins you add to revit will go here if they do not autoinstall to another location.¬† This folder is referenced by the revit.ini file for plugin locations. -Contains all of the pattern definitions that ship with revit as well as instruction on how to build your own fill patterns, model and drafting. -There’s just too many good things in this folder to list them individually.¬† Specifically you can find shx font mapping, lineweight import and export configuration and some fun rendering files. -All your family files are here.¬† I suggest keeping these seperate from your custom family files in case you update or reinstall. -I’m not sure if this wipes when you close Revit or reboot, but revit basically puts a temporary copy of your files here. -IES calculation files are located here. I think that’s going to do it for today.¬† I will hopefully have another one for you come Monday!¬† As usual, enjoy, comment and have a great weekend! So this one is a short one but a hidden gem as no one seems to teach this in training and most people don’t find it until they accidentally click the little blue square grip on the temporary dimensions witness lines.¬† You can toggle between center of wall and face of core/finish (depending on how you have the temporary dimensions setup) by clicking — instead of dragging — the small blue square grips on temporary dimensions. Also demonstrated in this video. You can also drag these grips to other reference within that wall or to another reference point (this is where weak and strong references in your families come into play! ).¬† As always, hope this helps.¬† Leave comments and have a great day! Another TotD courtesy of the RevitCity chatroom. This one is something I hear asked a lot almost anywhere I go. 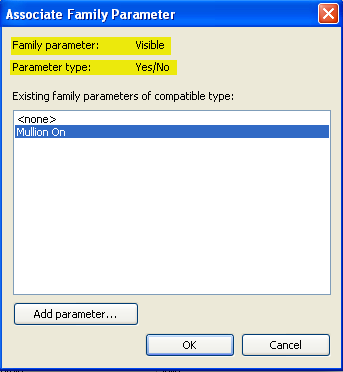 It delves into the family editor, which if the sound of that scares you, it’s just how us reviteers say “Open a family file (.rfa) with revit.” The goal of this tip is to show you how to make a parameter in a family which contorls the visibility of an object in the family. Go to the Family Types dialogue. 1) Name your parameter, i called mine Mullion On. Be appropriate with your parameter names so that someone knows what the parameter is for when you are not there to explain it. 2) Up to you, there are only a few appropriate parameter categories. I usually use Identity Data, Construction, or Graphics for this type of parameter. 3) Select “Yes/No” from the Parameter type. Otherwise this will not work AT ALL. 4) Whether this is an Instance or Type parameter is up to you and is the scope of another TotD. Basically, do you want to have to change family types in order for this parameter to be used? If No, then use instance. Hit OK a couple of times till your back to the canvas. Select your object (in this case, my mullion) and go to the properties. You will see a parameter called “Visible.” To the right there is a blank button under the “=” column. Click it to link the Visible parameter tot he Yes/No Parameter. 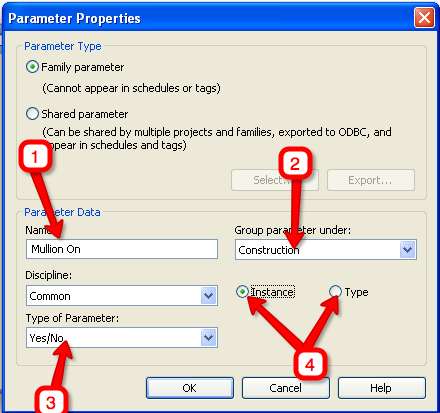 Select your parameter from the list of parameters to choose from. Note that this dialogue knows that the “Yes/No parameter type is the only parameter type that is compatible with the Visible parameter. You’re DONE! You can test if it works by going back into the Family Types dialogue and toggling the Mullion On parameter. If the object greys out, then you are in business! The video demonstrates this working in a project. Well there you have it. Once again I hope this helps you in some form or fashion. I made my parameter as an instance parameter so you don’t have to change the family type to control the visibility, but you can make it a type parameter to fit the needs fo the family you are working on. Revit TotD – 3.16.09 | Visibility Control, Filters and You! This one come courtesy of Steel2Steel on RevitCity.com chat room.¬† It relates to his post here.¬† He was wanting to make his revit model look like a CAD drawing.¬† This blunder aside, I decided this wul dbe a nice little tip for my TotD readers.¬† Enjoy! Filters are your friend.¬† When it comes to Visibility Control in Revit, you can do a LOT of fun things with filters.¬† Have a look at this video on how I made the walls in this model appear different from the others. If you already have a filter to add, you can add it, or you can create and remove filters from your projects.¬† You can transfer filters from other projects using the “Transfer Project Standards” tool. Choose the categories you want the filter to affect. Select how you want the filter to override the graphics for that view.¬† The nice thing here is that you can change how it overrides the view for each view. Hit ok, make sure the elements you wan tto be affected have their parameters set correctly et voila! 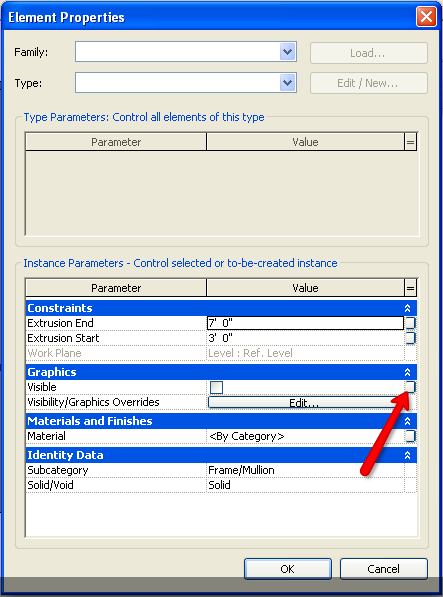 Hopefully this opened a whole new door for you revit users to venture down.¬† You can create any type of parameter to control these filters.¬† Good luck, and as always, leave comments! Yeah, so my tip of the day turned into a tip of the week.¬† So sue me for false advertising (please don’t, I have enough problems as it is and very little for you to win in an actual lawsuit).¬† It just so happened that I decided to start tip of the day, 2 days before spring break started.¬† And… well… let’s just say that it was a much needed spring break.¬† Anyhow, onto the reason you’re here. I tend to get my TotD ideas from questions asked from fellow reviteers and from things that make me laugh as I am working when I think of how many people have asked me how to do the seemingly mundane tasks in Revit.¬† Today I had a good friend of mine (@ghogsed) mention something about renders turning out to be too dark.¬† I mentioned the Adjust Exposure tool and realized that a lot of people ask about this so I’m guessing it’s often overlooked like a majority of the tools available to a Revit user.¬† So here we go!¬† The “Adjust Exposure” tool is available after Rendering your scene in Revit Architecture 2009. You will most likely notice that interior renders often turn out too dark.¬† This is because our default friendly Autodesk setup was calibrated to exterior renders, and hopefully the sun is brighter than your interior lights.¬† Demonstrated in this video. Hope this helps someone!¬† Please feel free to leave me feedback!¬† Have a great St. Patty’s day!